My name is Katya Redkina and I am a Fulbright scholar from Moscow. I teach English and psychology at Moscow State Linguistic University which I graduated from 6 years ago. Now I am developing a Syllabus for the course in History of Psychology. The idea is to create a course in English for Russian students. I attend classes and seminars for teachers. I want to see how psychology is taught in the United States and adapt it for the Russian Educational system. Besides History of Psychology, my interests are linguistics, educational psychology, cognitive psychology, counseling, and psychotherapy. My PhD work concerns laws of visual perception of ambiguous figures. I am happy to be here at the Center for the History of Psychology and the University of Akron as part of my Fulbright scholarship. When applying for the Fulbright scholarship almost 16 months ago, I could not have even imagined the kinds of thing that I would find at the Center. However I was lucky and got this almost once-in-a-lifetime chance not only to meet wonderful people, but also to plunge into a completely new world of archives, artifacts, manuscripts, books that smell (yes, age has a particular smell), finding aids, moving images and much more. Trying to stop myself from opening every box and looking through every book I found, I had to focus on a certain subject matter; but what would it be? 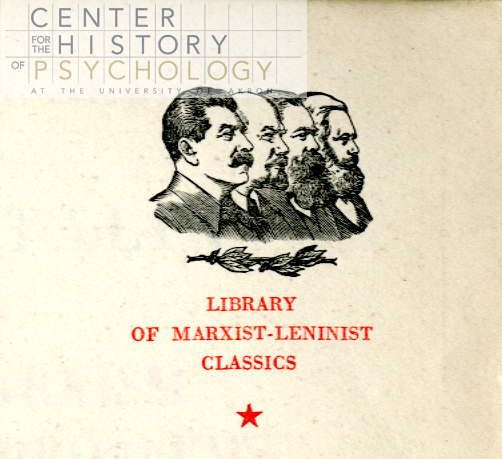 The answer came soon: what might be more obvious for a Russian psychologist at the Center for the History of Psychology than to search for material about Soviet or Russian psychology? When I started looking through the collection, I was lucky again (not without the help of my friends). One of the first boxes I opened had something I was not expecting to see. A small, almost tiny book published in Moscow in 1954 called “Marxism and problems of linguistics”. Anyone being at least a little bit familiar with Soviet history will know that Marxism was something you do NOT expect to see on a book cover of the mid fifties. It is not even the connection between Marxism and linguistics that surprised me. What surprised me most was the author. The book was written by none other than J.Stalin. Should language be considered either a superstructure or the basis? Is language a class or non-class phenomena? The characteristic features of language, etc. 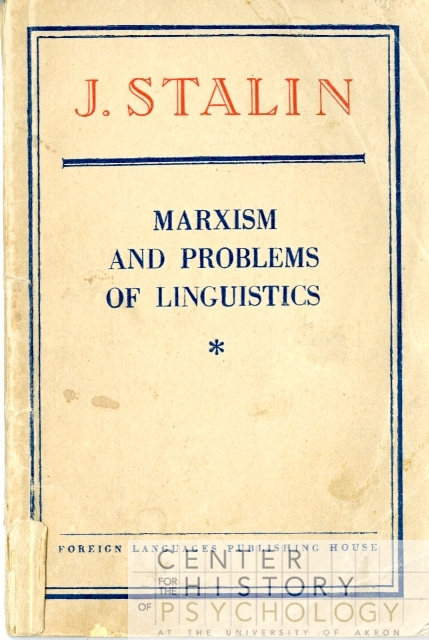 Stalin confidently answers all the questions through the prism of Marxism and also refers extensively to the Soviet linguist Nikolay Yakovlevitch Marr, the author of Japhetic theory. What seems even more fascinating to me, is that if you feel particularly interested in this book, you can easily find it in famous book stores. The full text may also be found online. There is even a Facebook page of the same name. And of course, you can come read it and all of the other books in the library here at the Center for the History of Psychology! On October 8th Latin-American countries celebrate Latin-American psychologist day! As a way to celebrate this date, we initiated a project at the Center for the History of Psychology (CHP). Our major goal is to find international content in the CHP collections. The first stage of this project was searching for documents related to the 22 Iberoamerican countries in the CHP’s collections. We used the names of these countries as keywords. We looked at all digital Findings Aids and Inventories and in this initial step we found almost 300 entries!! There are countries with more entries than others. For instance, Mexico was the country with the highest number of entries, 84. Interestingly, Brazil was next one with 43. Unfortunately, we did not find entries for all Iberoamerican countries. Countries with the highest number of entries in the initial search. We found a variety of material from the 1920s and 1930s through the 2000s. 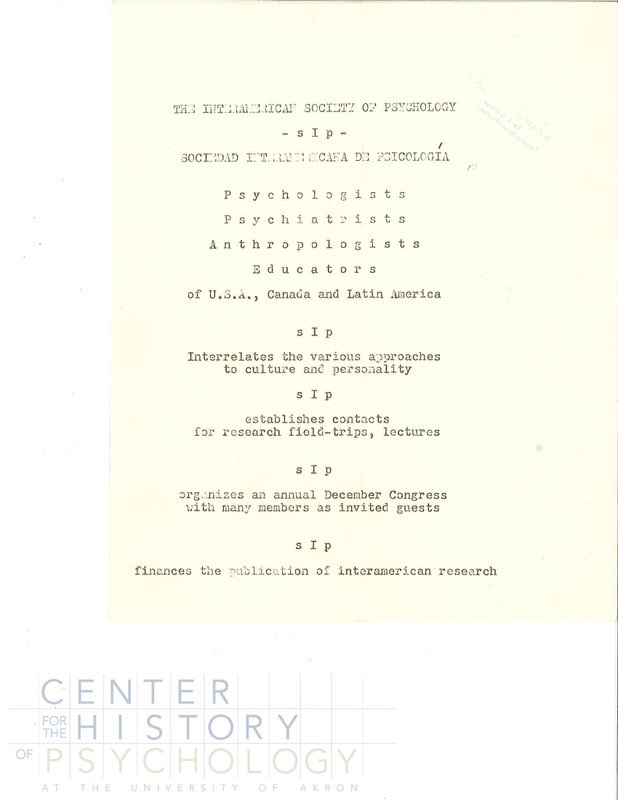 For example, in Henry Lidgren papers (USA), we found a report sent to UNESCO about Social States, Intelligence and Educational Achievement in the 1960s. This text was written in co-authorship with Hilda de Almeida Guedes (Brazil), researcher on psychology and education. 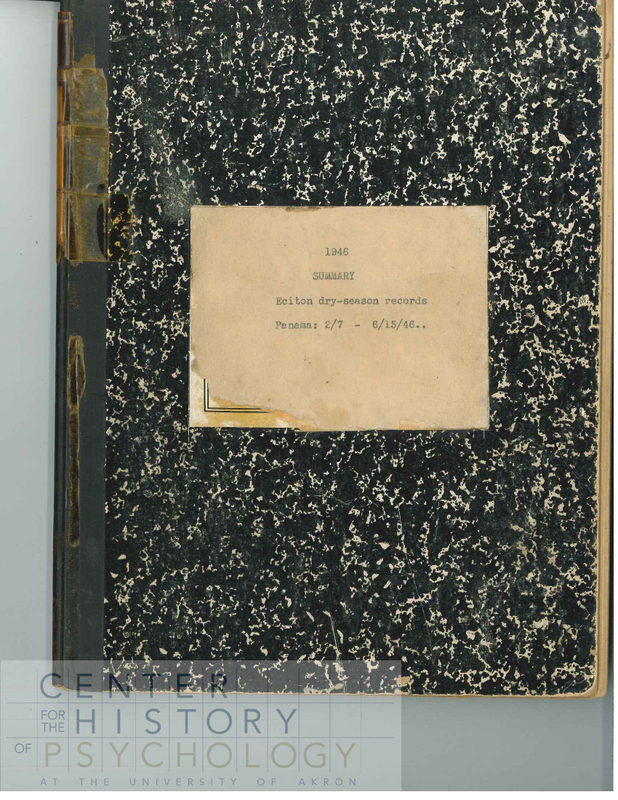 Another example was found in the Gardner and Lois B. Murphy papers (USA) collection. 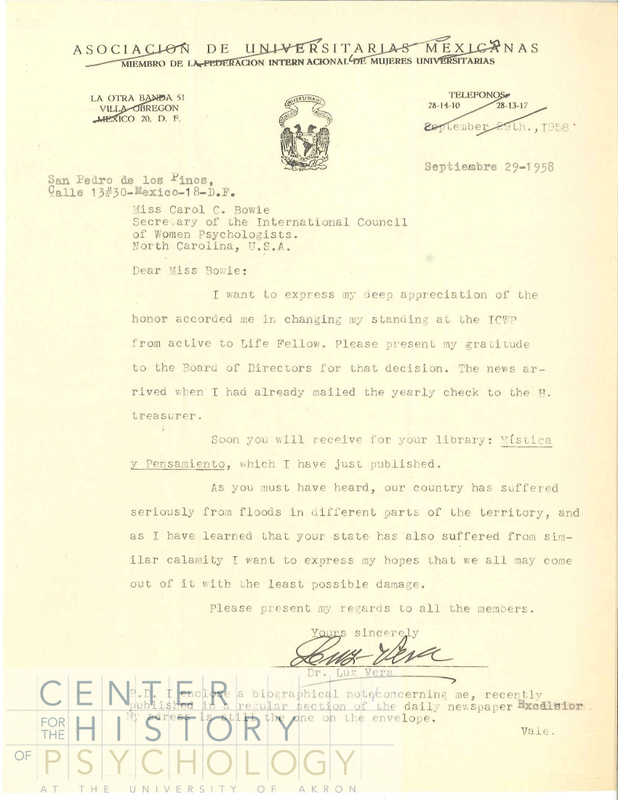 This source shows the discussions between Gardner Murphy and Wayne Holtzamn (USA) on data they collected in cross-cultural research on personality development, including Mexico. 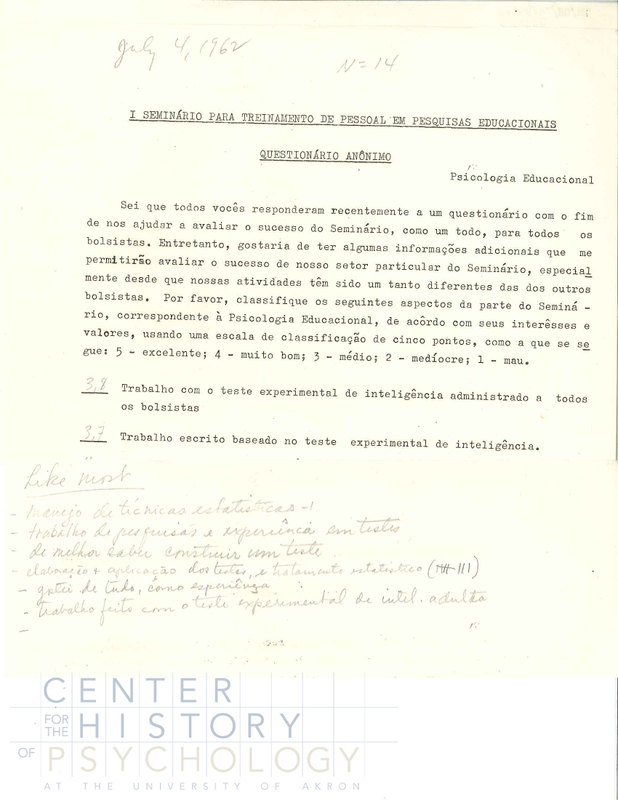 There is material from different scientific societies and conferences, such as meetings of the Inter-American Society of Psychology. Another example is the frequent mention of Iberoamerican psychologists in the International Council of Women Psychologists (ICWP). Analyzing such material would help us see the formation of scientific communities, the issues that circulated in these groups, the dialogues between psychologists, etc. More specifically, these materials provide a view of the participation of Iberoamerican countries in a larger psychological community. This initial analysis shows us future research directions. We can see how psychologists organized themselves informally and how they established international networks. There are many letters between psychologists talking about Iberoamerican countries or data about those places. We also can find budgets for research, the circulation of material between psychologists and countries, and so on. 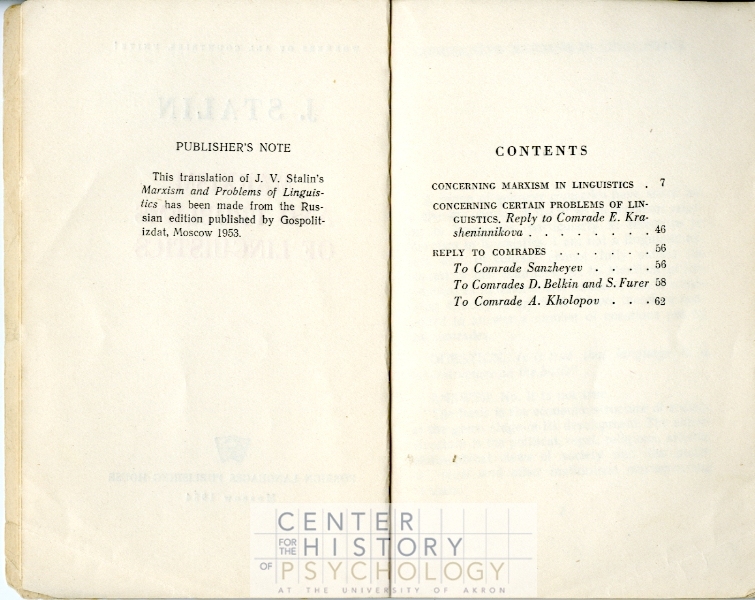 These sources can help us to tell stories of psychology in circulation around the world. Also they can help us to see the participation of psychologists in the Iberoamerican organization and circulation of psychology. In addition, they allow us to see how other countries have built images about the Iberoamerican countries. This is a work-in-progress project, i.e., we continue to look for more material on the history of Iberamerican psychology at the CHP. One next step could be use as keywords the nationality and not the name of the countries. For example, use “Peruvian” rather then “Peru” in searching for entries related to this country. We also can search for names of state capitals or major cities in each country. Our work also could also examine the most commonly found type of source, and especially to see in what context these documents appear. Are you interested on these materials? CHP invites you to take a tour of its online collection here. Or come schedule an in-person visit! ~ contributed by guest blogger Dr. Ludy T. Benjamin, Jr.
Pictured below is a tiny paperback book, designed to fit in a uniform shirt pocket, and issued for the men and women of the United States Military during World War II. These little books were commonly known as ASEs or Armed Service Editions. They were published by the Council on Books in Wartime and distributed free of charge to servicemen and women between 1943 and 1946. There were 1,322 different titles — fiction and nonfiction — intended to contribute to the entertainment and education of America’s military forces. 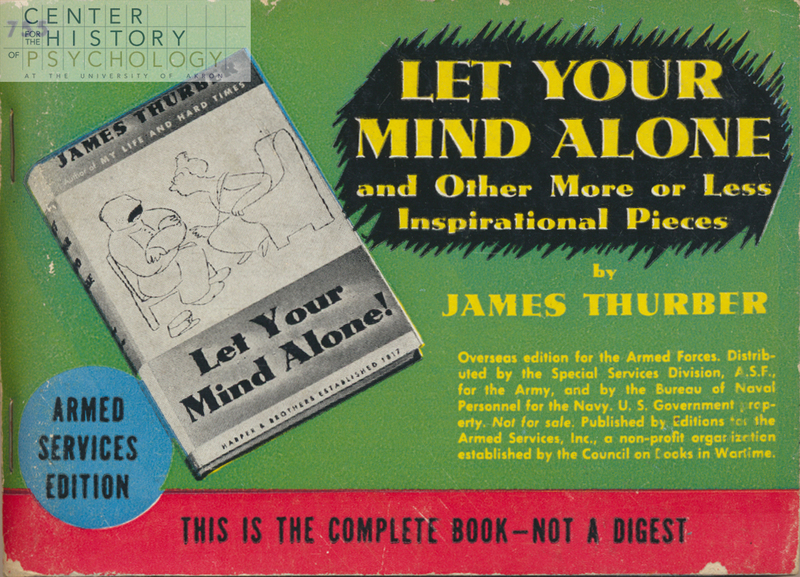 The series included works by Edgar Allan Poe, Virginia Woolf, William Wordsworth, John Steinbeck and, in the case of the photo below, a collection of essays and stories by American humorist James Thurber entitled Let Your Mind Alone. 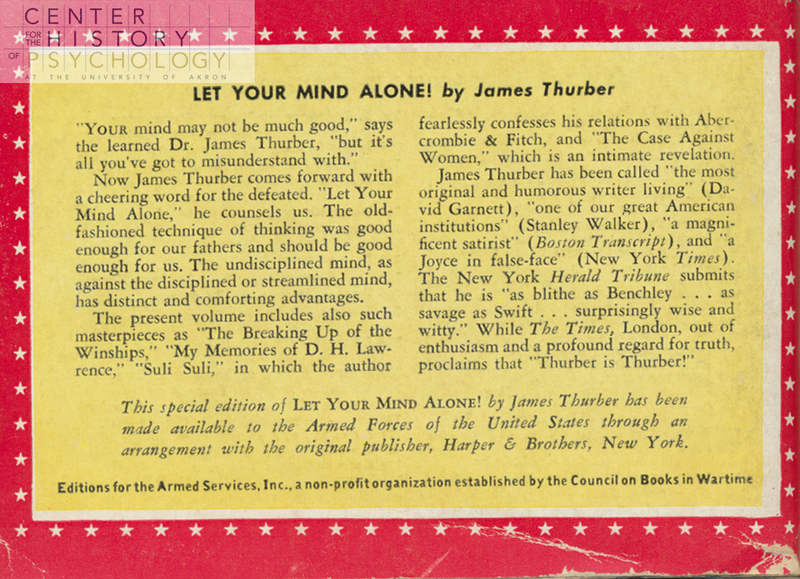 The story of Thurber’s little book, however, begins a few decades before the war. With unemployment in the United States reaching 25% in the Great Depression, many Americans sought to reinvent themselves or at least to seek out new strategies for success and happiness. Books and magazines that promised such outcomes were even more prominent in the 1930s than during the economic prosperity of the Roaring Twenties.